Oil fires burn around USS Shaw (DD-373) in Floating Drydock YFD-2 after three almost simultaneous bomb hits from Aichi D3A Type 99 dive bombers attempting to sink USS Nevada (BB-36) whose bow is visible in this view at extreme lower left. Five bombs hit on or near YFD-2. For a half hour after the bomb hits, Shaw's skeleton crew fought the fires caused when two bombs pierced her forward machine gun platform and crew's mess, and the third went through the port wing of the bridge. Oil tanks ruptured and fed a blaze that spread to the wooden blocks she was resting on. 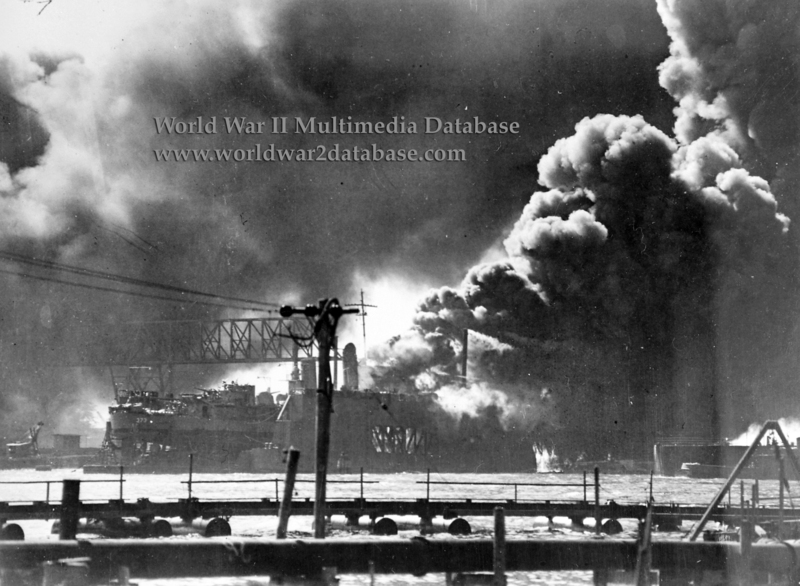 Then the fire detonated Shaw's forward magazine, severing the bow and piercing TFD-2's watertight integrity and she partially sank with a list of fifteen degrees. Harbor tug Sotoyomo (YT-9), also in drydock, was also sunk. Shaw's bow section sank, but her severed stern floated. YFD-2 needed over 155 patches but was returned to partial service on January 9, 1942 and fully repaired by May 15. Originally considered a total loss, Shaw was the first victim to sail under her own power to the United States on February 9, 1942 with a temporary bow fitted. Sotoyomo was also returned to service in August 1942.